There’s frankincense and gold … but wait - there’s mrryh! 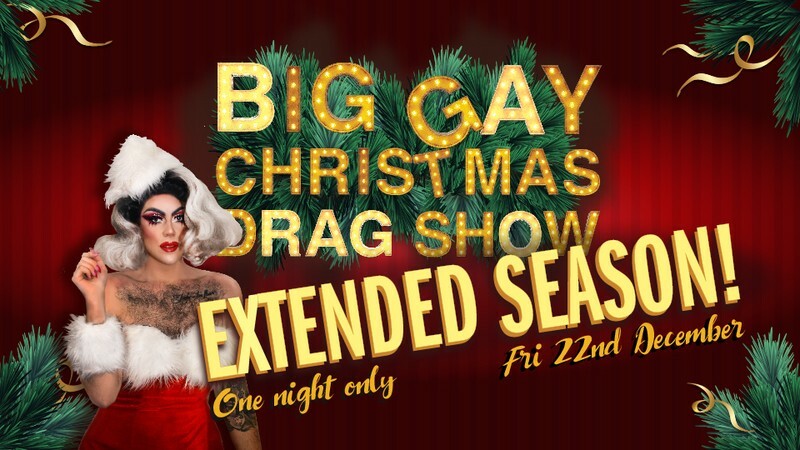 Christmas has come early for those who missed out on our last sold-out season because The Big Gay Christmas Drag Show is back, for one night only! 'Twas the night before Christmas, and all through the house, not a creature was stirring … obviously. They were all at The Big Gay Christmas Drag Show! Looking for something a little sparkly this silly season? Why not make your Yuletide definitively gay with a festive and fierce drag spectacular sure to get you in the Christmas spirit? With a cast of ho, ho, hoes snatched straight from Santa’s naughty list, this holly, jolly ordeal promises to be a not-so-silent night out. So slide on down our chimney and grace us with your presents this December. It’s going to be unbe-wreath-able. A campy cabaret so raucous and raunchy, you’ll want to touch your elf. Starring a cast of the capital’s finest dashing dancers, prancers and vixens! Robin YaBlind: the rudest of Rudolphs. Kelly Fornia: she didn’t come to play, she came to sleigh. And hosted by NZ’s reigning drag King of Kings, the adorable, Mr. Hugo Grrrl: Drag King! It’s a show that’s open to everyone - elves, reindeer, straights, queers and grinches alike. All we want for Christmas is you, so book your tickets now. Or really warm your cockles with a $35 VIP ticket for a front row seat, a glass of bubbly, and priority pictures with the cast. And why not get a little holly jolly with our $10 cocktail special - The Santa’s Sack! Full to the brim with surprises. You can book us for your Christmas party! Are you looking for a fun, festive and affordable end-of-year get together for your mates or workplace? We’ve got you covered! The Big Gay Christmas Drag Show is an utterly unique and memorable option for any Christmas function or ‘do, no matter the size or requirements. Eat, drink and be merry with our fantastic food and drink packages available courtesy of The Fringe Bar. Book a seat, a table, or the whole place out for a splashy private function this December - or we can even bring the show to you! Dates will book up fast so get in touch soon at contact@hugogrrrl.com. Graphic Design by Philippa Clark. Modelled by Luna: Queen of the Moon.